I am in a rare place in my life (as a primarily stay-at-home-mom) where I can spend time pondering my career path and calling in medicine. 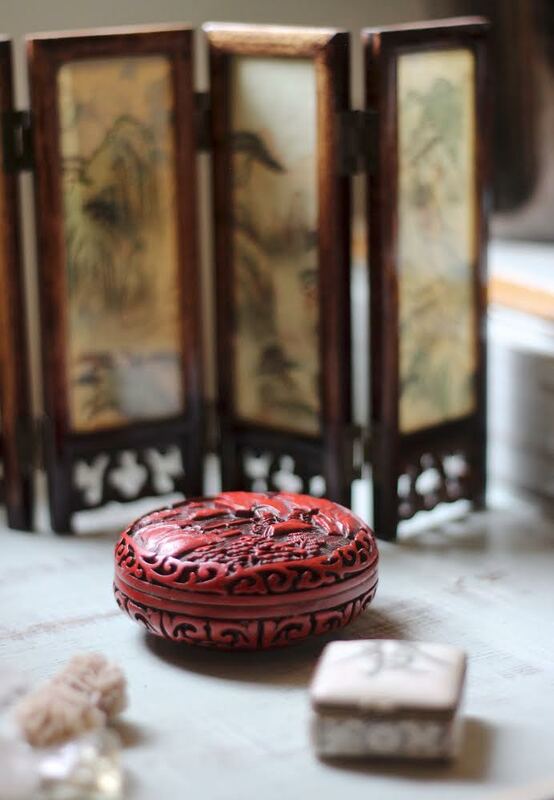 For a few months now, I have wondered if I will every truly understand one side of the medicine that I practice: East Asian medicine (a term I like to use for acupuncture and Chinese medicine). The answer deep inside me is a resounding NO. I will never really understand East Asian medicine. Because I am not of the culture from which the medicine is derived. It’s not of my ancestral line. And I haven’t been immersed in any aspect of Asian culture. I’d love to work at a hospital in China. I’d love to study the Classics with a knowledgeable teacher. I’d love to dedicate many years to learn a lineage of Qi Gong. I could read all the books and go to all the conferences and do all the things and get all the degrees…and I’d still never really know Chinese medicine. I can live with that. I accept that I can do the best I can as a practitioner in this medicine. Without a doubt I feel that undergoing Chinese medicine training was the ideal path for me. 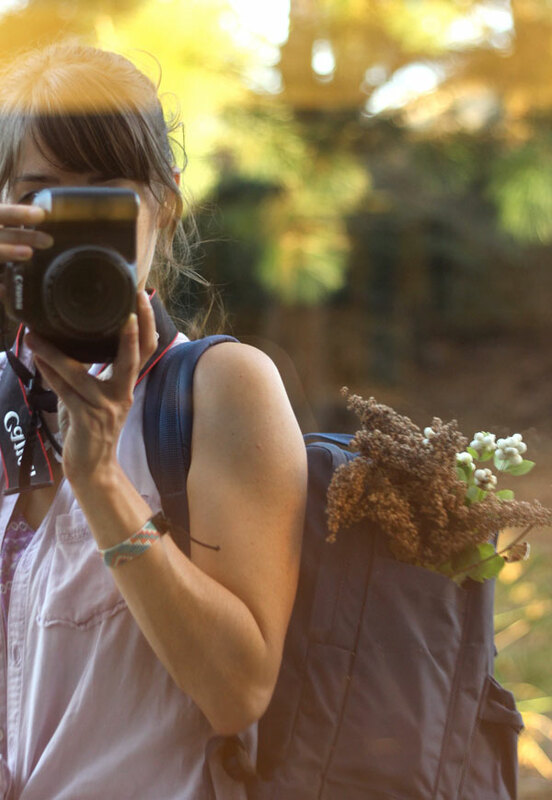 But still…there is a deep question underneath it all which I wasn’t anticipating: Am I missing out on something, or ignoring, the cultural connection to the healing path and herbalism within my own ancestral line? More and more I’ve been hearing people say that the word and concept of Chakras are being culturally appropriated. I would not be surprised to see conversations about the cultural appropriation of Chinese medicine, too. That gives me a lot to think about. I feel a sense of responsibility to figure this all out. To learn more about cultural appropriation in general, and to research the origins of white people administering acupuncture and Chinese medicine. I have my own opinions about Chakras, but I don’t know where I stand with East Asian medicine. It’s complicated and too close to home. I can’t separate my own experience from the greater context of white supremacy and the profiting off of other culture’s property. But honestly my main hang up is that I just don’t feel like I have the time or brain power to stay abreast of these issues. Man, that makes me feel so guilty, like I’m being irresponsible. Guilt aside, I’ve been thinking about this for a long time. Recently I heard some very interesting things from the Mythic Medicine podcasts from Amber Magnolia Hill about the power of reclaiming our own healing heritage. If any of you know her work, then you know how connected she is to working with your genealogy and ancestry, and talks to many inspiring guests about these topics like the mothering line and so much more. Amber’s insight and her poignant interviews are like a breath of fresh air for my current state of trying to integrate who I am at this point of my life. All that I’ve read about the power of connecting to our ancestry has made me really REALLY wonder why my path as a healer has taken me outside European and Western traditions. Why did I get into East Asian medicine to begin with? What am I missing from within my own traditions? I AM connected to my European and Western ancestry, motherline and healing traditions after all. I can feel a connection the land of my ancestors, the potency of Western earth-based spirituality, wounding as a woman in this culture (from patriarchy, monotheism, and reductionist thinking), and I have for a long time (ah…it’s an interesting but long story for another post). I have had a connection to the body and the Earth that is very much in accordance with East Asian medicine, and have had that for a long time, too (what this post is about). I love acupuncture and Chinese medicine. Sounds cliche, but it truly is an amazingly rich and functional medical system which works for me. I love how Chinese medical principles and diagnostics integrates herbalism and the hands-on physical and energetic medicine of acupuncture. I am a body person and I love that I spend so much time palpating people and listening to their body. Yes, I am gushing. But I love it all. I often feel like I’ve been pointed in this direction for a long time, even though I didn’t know what acupuncture was until I was 19 years old. My attention was and still is held in the tip of a pin or needle. 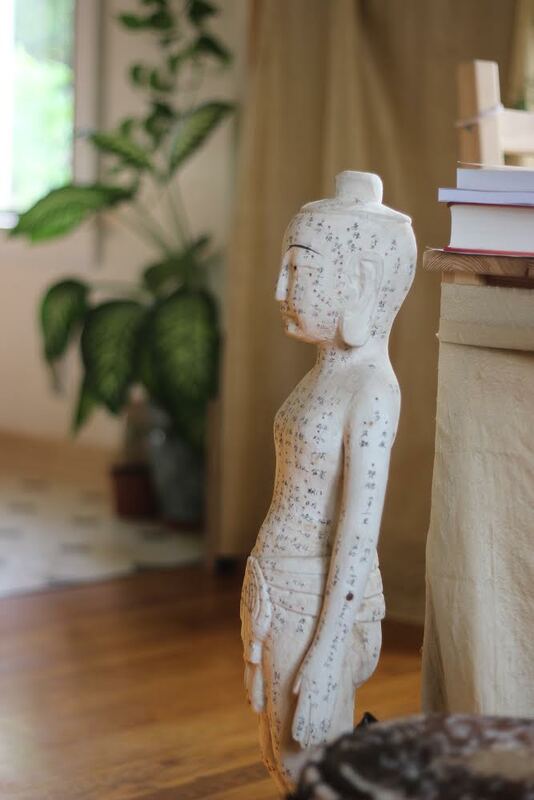 When I am doing acupuncture or shiatsu, I can see and feel the teeny tiniest point of focus. For as long as I can remember I’ve always been this way. Once I went to a kids birthday party and some of the adult attendants were looking at a super small play packaged food for a play house. There was a play box of food that was about less than a half inch tall. I picked it up and started to read the print on the minuscule label, and everyone in the vicinity was shocked that I could see the print, let alone easily read it. Turns out nobody else could even see it well enough to read a single word, even my husband Rob who has better than 20/20 vision. That was a big realization for me. I had no idea that that level of seeing small was atypical. I can go small with my perception. I can focus deeply. I can see things other people can’t. This is one way in which the technical aspects of acupuncture and I strongly resonate. Fellow East Asian medicine practitioners will have their own unique ways in which they resonate with the technical aspects of this medicine; this just happens to be one of mine. Another this is that when I was a kid, I kept a stick pin in the hem of my shirt. It was my tool. Throughout the day I would take it out and touch things with it. Pick at things. Fix things. Feel things through the needle. My favorite thing to do with it was to clean the dried residue between the letters on everyones toothbrushes (gross, but totally me). I also loved to use the pin to make designs on leaves and fruit (especially bananas). I had forgotten this until it flooded back to me in acupuncture school. We first needled fruit before needling our classmates. When I was needling the orange I felt such a distinct body memory, then after class I recalled the pins I used to carry around with me. Around the age of 8-10 my friend Melissa and I would play this game called “planting roses” on the inside of our forearms. We would use our fingertips and nails to rake the soil, plant seeds, cover them, and water them. We had three distinct rows which we “tended”. The skin would turn bright pink in the spots where the seeds were planted, which we said was the rose blooming. Those three rows were acupuncture channels (Lung, Pericardium and Heart) and we were essentially doing acupressure and shiatsu to our Arm Yin meridians. This really interests me because Rose medicine enters the Heart and Pericardium. Of course roses would bloom there! My dear friend Suzanne, who I’ve know for a long time, reminded me a few years ago of a dream I had and told her while I was 7. She was the keeper of this dream for so long, and when she told me about it I was floored. I dreamt that I was outside my house when a Chinese woman came up to me and had a submarine sandwich for both of us. As she handed one to me she said, “eat this under your wealth”. She crawled under her truck and started eating her sandwich. She lived in her truck, she was a traveler. Then she looked at me in a loving and supportive way and said “hong chung mai hua“. Truth be told I have NO idea what this dream really means. And the Chinese she spoke to my seven-year-old self doesn’t mean anything (I asked Chinese speakers about it when I was at OCOM). However, the stand out impression from the dream is the deep support and knowing of the woman. And when she gave me the sandwich I felt as if I was being passed something valuable. It was a transference. There was another supportive dream I had about a year ago. I entered a massive auditorium. My class was graduating from Acupuncture school and the ceramony was held in North Carolina where an herbal conference is held. It was filled to the brim with people. As I entered and walked down the wide central stairs, I was surprised by all the people who were there specifically for me, cheering me on. First there were lawmakers from congress. Two elderly congressmen looking very appreciative and reverent, one of whom was holding a photo of a third gentleman. The third guy in the photo was a part of their laws making cabinet in the past. The three men always dreamt of a day when healthcare would support vital health and caring for the aged, and today it was happening. I continued walked down, deeper into the huge room. There were beloved herbalists and they were there to congratulate me as a former student. I was so touched at how genuine and supportive everyone was. I kept on walking down the steps for what seemed like all evening, the whole while groups of people where clapping, cheering, standing for me, of all people. At last I reached the bottom of the huge auditorium. Everything became silent as I stood still in que. I was adorned with a black clock and a graduation hat, then escorted to a line of Chinese teachers, masters, physicians, lineage keepers. They shook my hand, hugged me or gave me special wishes, and I was given my diploma. I felt like they believed in me and I had their deepest blessing. This dream was so reassuring. It came at a good time and helped me feel like I was indeed on the right path by being in this medicine. It ignited a sense of appreciation of the of support, knowledge and skills I had to practice my medicine with full trust and confidence. I was 7 months pregnant with my second child and I was beginning to disengage with my work life, ready (but with grief) to put working with clients and patients on hold while I was rising little humans. This dream said,”don’t forget this medicine! This is your path! You have what you need to do this medicine!”. Interestingly, a few hours after I had this dream I randomly ran into someone I graduated with from OCOM almost 4 years prior in apart of town neither of us go to (she didn’t even live in Portland anymore). Not only did we graduate together, we stood right next to each other during the ceremony. Amber Magnolia Hill has a fabulous interview with Stephen Harrod Buhner on the Medicine Stories Podcast (as all her interviews are). Buhner has a unique perspective of ecological co-existence with nature and weaves it into his writings. He writes extensively about plant intelligence and medical herbalism and I would say his numerous books on intuitive herbalism, Herbal Antivirals, Herbal Antibiotics and Healing Lyme are classics. 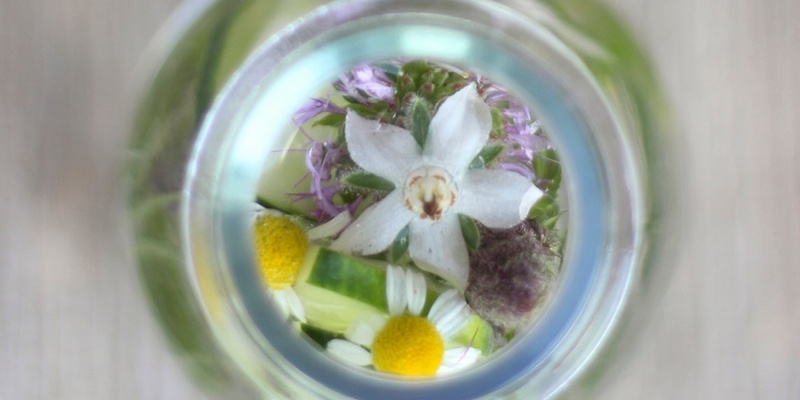 “…we [the herbalists from Buhner’s generation] carry a certain lineage within ourselves which is important to pass on. Then when people like you [talking to Amber] encounter it, they can feel there’s something in it that calls to the depths of them, that same journey itself is then necessary to be taken. “To be transformed in that way so that after our generation is gone, we’re already starting to die off, then you yourself can pass it on to other generations. This passage rang true for me as I was beginning to express my questioning about following a path of East Asian medicine and not just a path of Western herbalism. I’ve caught the threads of Eastern medicine. It’s a spreading paradigm as Buhner speaks of, no doubt. I’m grasping its threads and pulling it into my being the best I can, where I can consciously and spiritually integrate it, and be a bearer of it’s gleanings. Much of Chinese medicine is based on Daoism. It is a way that ancient people looked at the world around them. I have little knowledge of the system of Daoism, and it’s impossible to sum this system of thought and spirituality to a single quip. But my from very limited view, it’s not too different from what Buhner describes in his work as becoming one with the Earth, seeing the world through the Earths’ eyes. There is no separation between us and the Earth, the Universe and the elements throughout. The take away from my contemplation about this topic is that in it’s core, I think that East Asian medicine is a language or expression of the Earth itself. It is one way of looking at how the world works. At this core level, the healing traditions within my own ancestral line, which is essentially Earth-based spirituality of ancient Europe, has more in common with East Asian medicine than I thought. Perhaps practicing under this license brings me closer to my ancestral roots after all. I’m thinking back with much fondness to 2007-2008. Ten years ago was a very special time for me. Foundational. Formative. Dreamy. 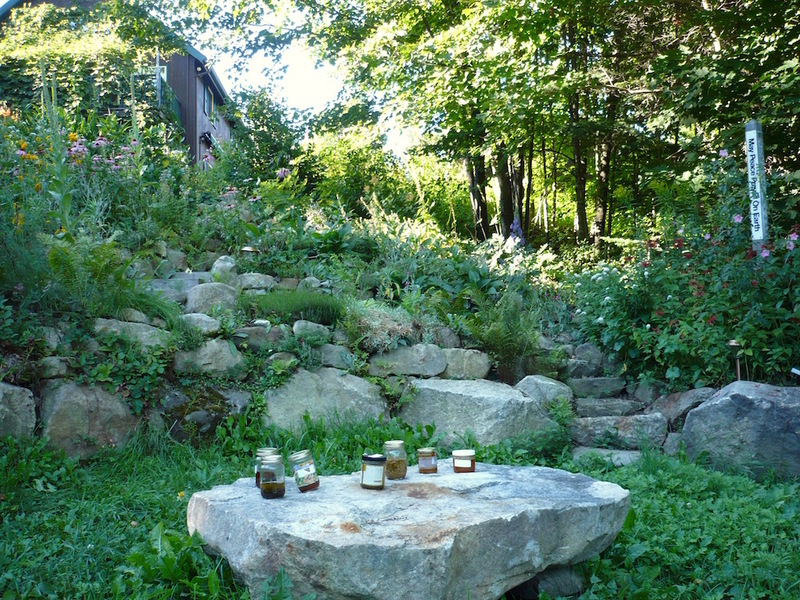 I spent a completely magical summer interning at Sage Mountain, an herbal retreat center and botanical sanctuary in the mountains of Vermont. A fellow intern and I had the best job: working in the herb gardens under the guidance of an amazing gardener in trade for living on premise and attendance to the workshops and conferences. 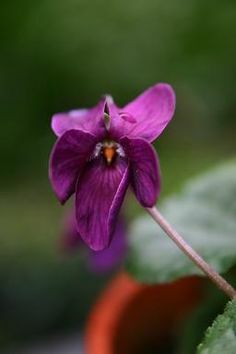 It’s no secret that I adore violets. As in absolutely adore them. 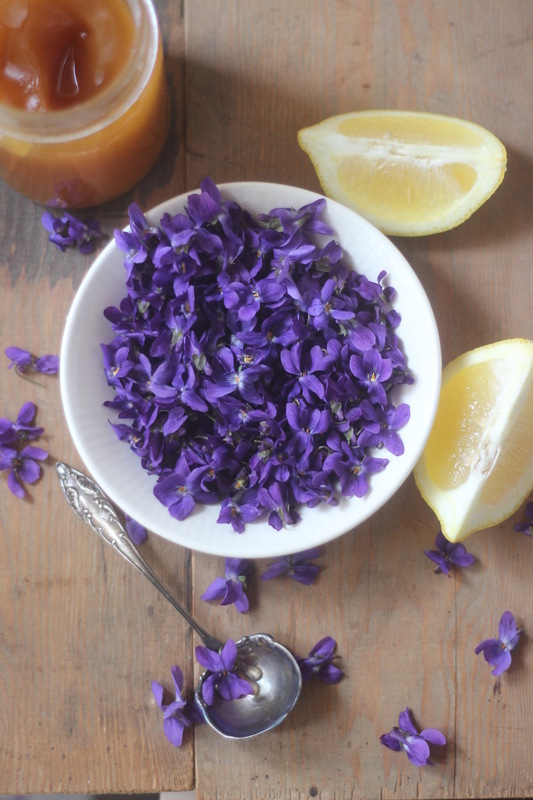 Some of my favorite medicines to make are the violet ones (rose too, then there’s linden, and chamomile, and red clover…). 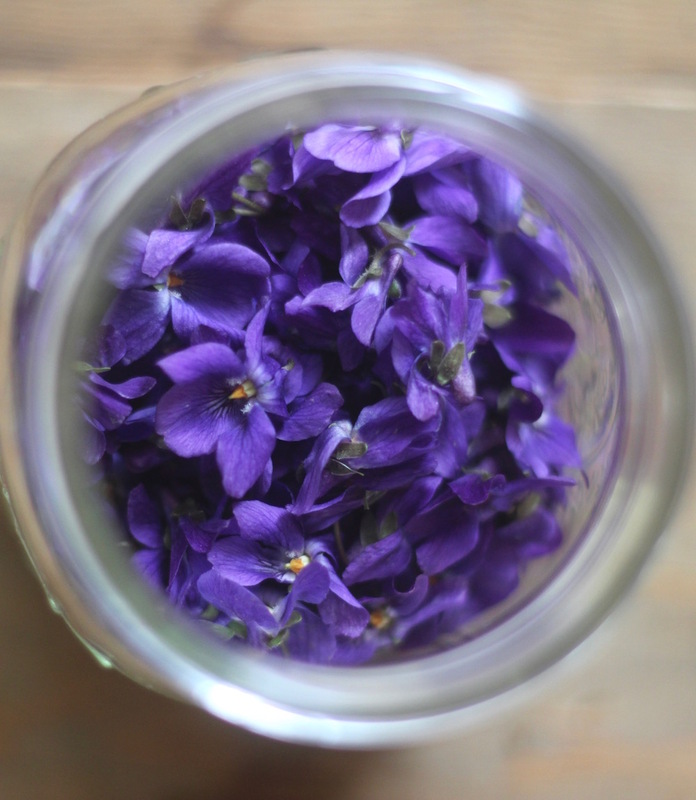 Violet elixirs, violet tinctures, violet glycerites, I even tried (and failed) to make a violet liqueur. Not only are they one of my favorite springtime plants of the garden and woods, but they are an invaluable medicinal herb. 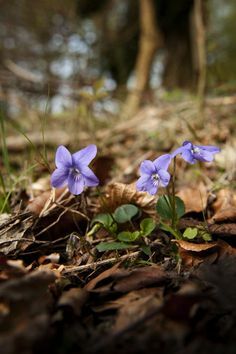 The thing about violet, along with other some other spring herbs like chickweed, dandelion and cleavers, is that it is so gentle and supportive, yet powerful at the same time. Spleen 6 is a triple-whammy point for the womb. It is named “Three Yin Intersection” because all three of the leg Yin acupuncture channels, the Spleen, Liver and Kidney channels, meet here. This makes Spleen 6 a fabulous point for supporting the uterus and lower abdomen, because all of those channels run through that area and have a direct action on women’s health. Because it acts so strongly on the pelvic organs, Spleen 6 is classified as the Ruler of the Lower Abdomen. Think of any menstrual problem, from irregular bleeding or sluggish-to-start menstruation, cramps, heavy or scanty bleeding, and so on, difficult or stalled labor, postpartum bleeding, or bleeding during miscarriage or abortion. It can also be used for pelvic pain, like for pelvic inflammatory disease, cysts, pelvic adhesions, healing distasis recti, hernias, or any lower abdominal surgeries. Spleen 6 is useful for lower digestive pain and tension, too. This makes sense because the Spleen is an important digestive organ. 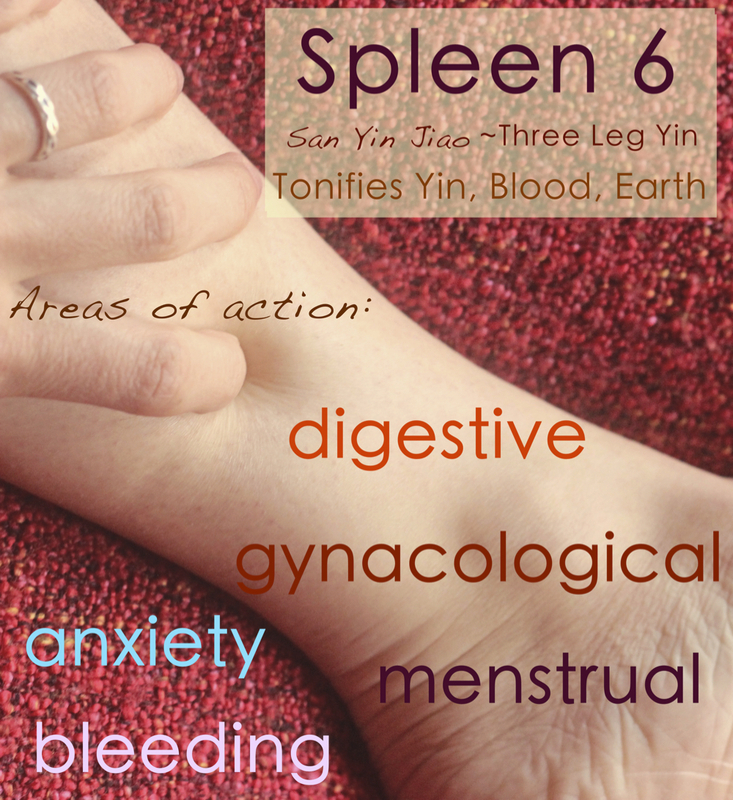 Spleen 6 is indicated for any and all gynecological issues because it strengthens and regulates Yin and Blood. Yin embodies the receptive, heavy, substantive, dark qualities of the body, earth, spirit and universe, and Blood is a nourishing aspect of Yin itself. Use Spleen 6 as part of a grounding meditation or reflection and intention setting for a full or new moon altar. Because of its grounding, earthy nature, engaging with Spleen 6 helps to interface with Yin within the body. Yin embodies the receptive, heavy, substantive, dark qualities of the body, earth, spirit and universe. Any Yin and Yin nourishing point is going to be grounding by nature, but Spleen 6 is even more so because of the Spleen’s association with the Earth element. Acupressure here combined with deep breathing and/or a relaxing body meditation (especially a womb meditation) can induce a feeling of being very grounded. Because of its downward physical and energetic flow, Spleen 6 can calm and release a tight chest, palpitations, anxious feelings, insomnia or simply being up in your head and scattered feeling. As a practitioner, I use acupuncture and acupressure to treat diseases and help people feel more comfortable. But as time goes on, I am leaning more and more to using the acupuncture points in a way that isn’t only fixing a pathology. Acupuncture can be used to supporting the natural processes of the body, to align the body with the energetic and physical ways it wants or needs to express. Spleen 6 is a great point to experiment with tuning into the feel of the point without trying to ‘fix’ something. Because of its broad action on anything menstrual or gynecological (or pelvic or digestive) and being so grounding, it can be used as preventative medicine during those times when when one needs flow, grounding and regulation of Blood. CONTRAINDICATION: this point is not to be used during pregnancy until the ‘guess date aka due date’ is near or passed. Technically, Spleen 6 is located three cun up from the point of the inner ankle bone, in a fingertip-sized divot in the fleshy part under the tibia, the inner shin bone. A cun (pronounced soon) is the measurement in acupuncture. It’s a measurement relative to everybody’s different sizes. One cun on me is going to be different from one cun on someone else. It’s roughly an inch, though, and often taught as the length of the middle part of the pointer finger, between the knuckles on the finger. A cun is measured using the person receiving acupuncture or pressure treatment in mind. To find Spleen 6 on someone else, a good rule of thumb is that is around four fingers width above the inner ankle bone. With your fingers together, touch the side of the middle knuckle on the highest part inner ankle bone, then notice the area of your leg on the side of your pinky. Spleen 6 is under the edge of the tibia (towards the back of the leg). Feel around with gentle pressure of the pad of your finger tip. Glide downwards to find the central divot of the point. This point may be tender to the touch, or not. 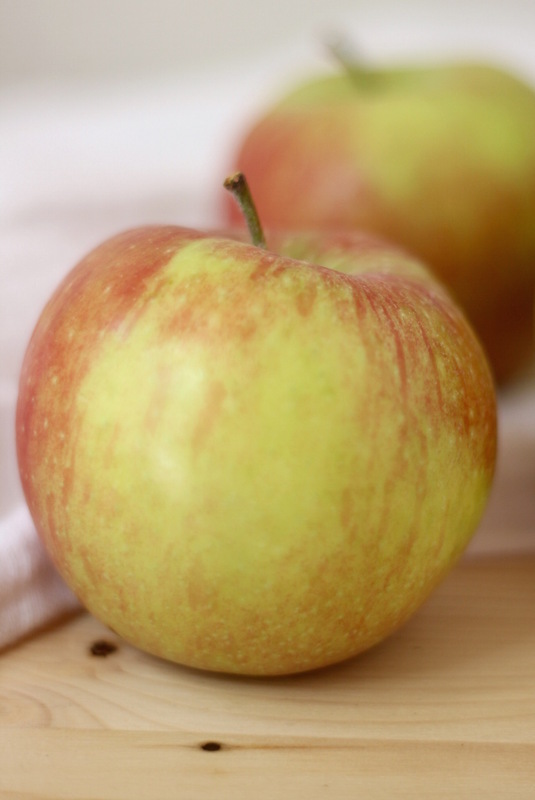 When you find it, apply moderate to strong pressure with the tip of your finger. Try to have at least the end of your finger perpendicular to the point to get the greatest pressure. I like to push about an inch into the point. Sometime I use my fingernail to really make a connection. However you touch the point, breath and remember your intention. Are you wishing feel a nice and easy menstrual flow? Coordinate uterine contractions during labor? Ease lower belly cramping? Feel calm and grounded, supported by the earth? Close your eyes and notice what this point feels like, where the energy is flowing locally in the point itself, up and down the leg, into the pelvis and lower abdomen, or anywhere else. Once you are in tune with the sensation of the point and where that feeling travels (if anywhere) tune into the organs this point traverses. Notice, observe, listen. Tune into your blood, the blood in your body and in your womb or womb-space if you do not have a womb. Imagine free flow. Sit comfortably. Take three grounding breaths. Breath in for 4 counts, hold for 4 counts, and exhale for 8 counts. Relax your body with each breath. Set an intention. What would you like to feel, learn, or observe? Take another breath to integrate the intention into your being. Locate Spleen 6. Take your time, but also don’t get hung up about the exact or perfect location. Feel for a spot that is inviting, active and connected. Experiment with pressure and penetration of the point. Press at different levels and angles until you find a level that produces a nice sensation you like. While holding the point, think of the blood flowing in your body. 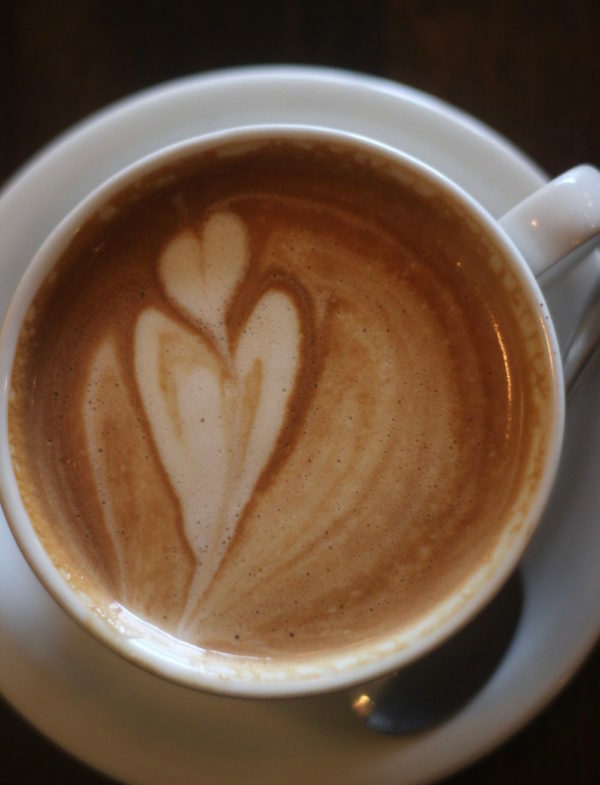 Start with a feel or image of the heart pumping, then the blood flowing though arteries, veins and capillaries. Bring your awareness to your lower abdomen or uterus. Feel the blood flow in and out of the area via the arteries, veins and capillaries. If you have a uterus, feel the blood circulate through it’s muscular wall. If you don’t have a uterus, feel the blood flow through your pelvic area and lower abdomen. 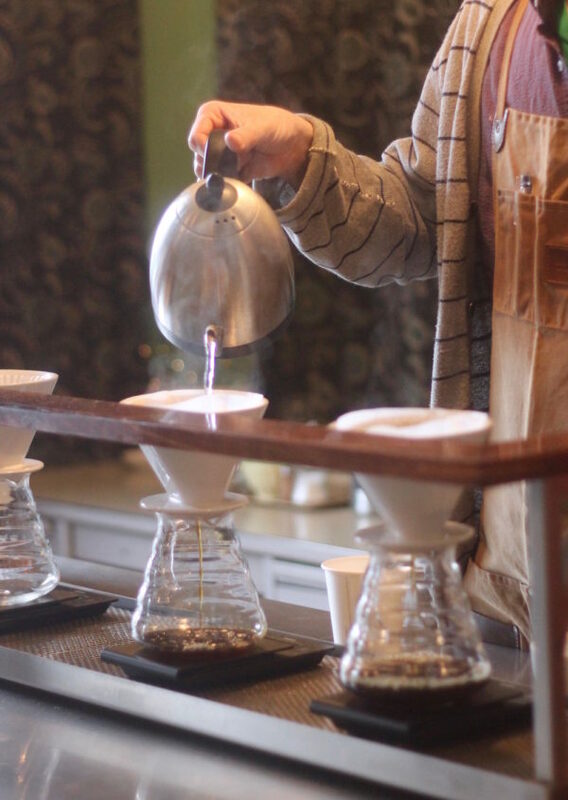 Settle your attention to a spot that would like to feel a healthy flow. It could be a spot that is achy, dark, cold, cramped, weak or simply needing some invigoration. As you breath and focus on this spot, feel your visualize your heartbeat move blood into and out of this area. Sit with your feelings as long as you’d like. Give thanks for your body, and the connection to the point and the wisdom held there. As a practitioner I’m always thinking of ways to get herbs into people, and one easy way to do that is the liberal use of spices. Think about it: the use of herbs and spices in your everyday cooking is like getting dose after dose of herbal medicine. 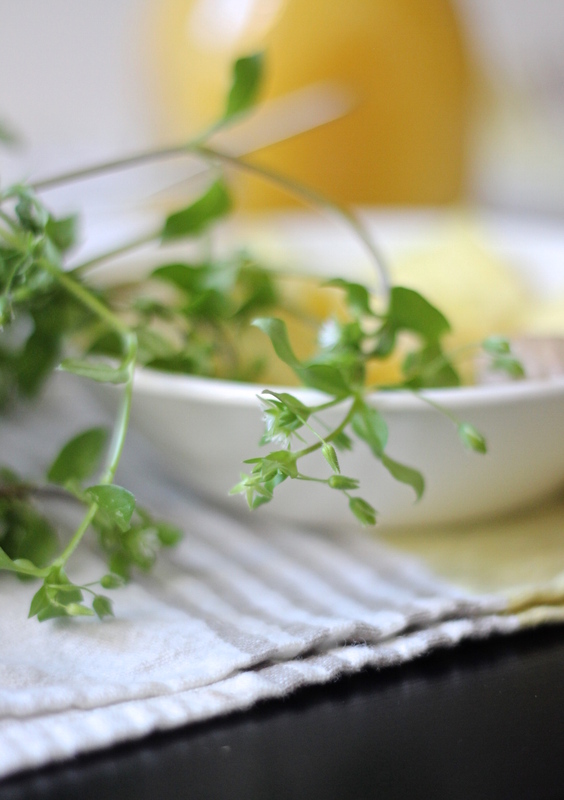 Don’t worry about side effects or overdosing; these food-herbs are ideal for mass consumption. If I do say so myself, this is probably the best smoothie recipe I’ve had in a while. Everyone I share it with says the same thing, “Oh my goodness, this is SO good.” I concur; and can’t get enough of it! 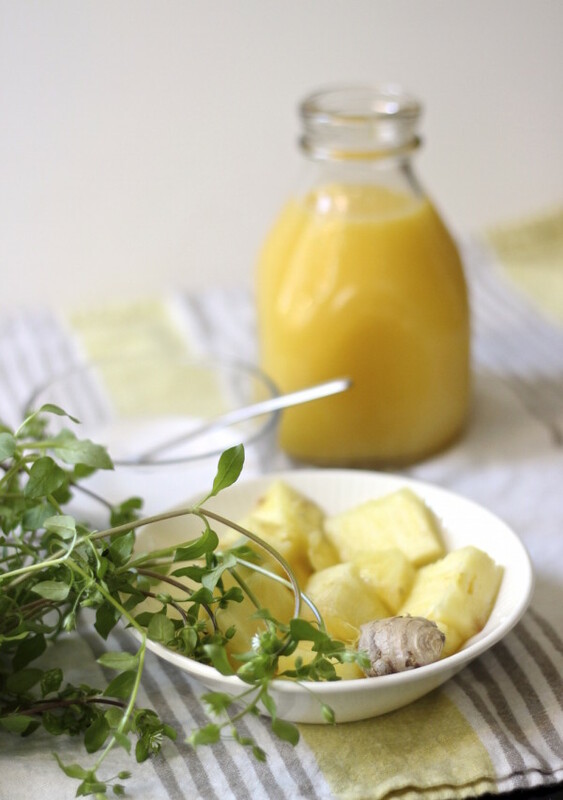 Each time I make it, the turmeric and ginger amounts creep up and up. So far I have yet to approach the too-much-turmeric level. 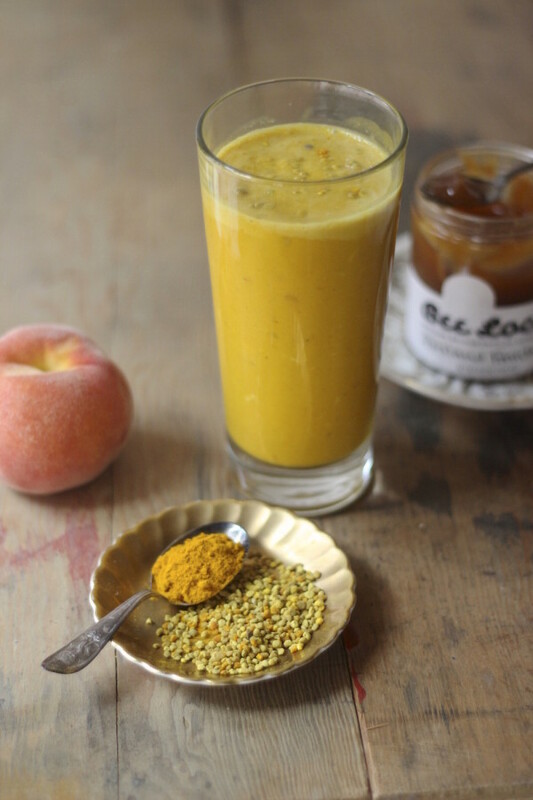 This smoothie was inspired by golden milk, the turmeric and coconut milk drink of Ayurveda. 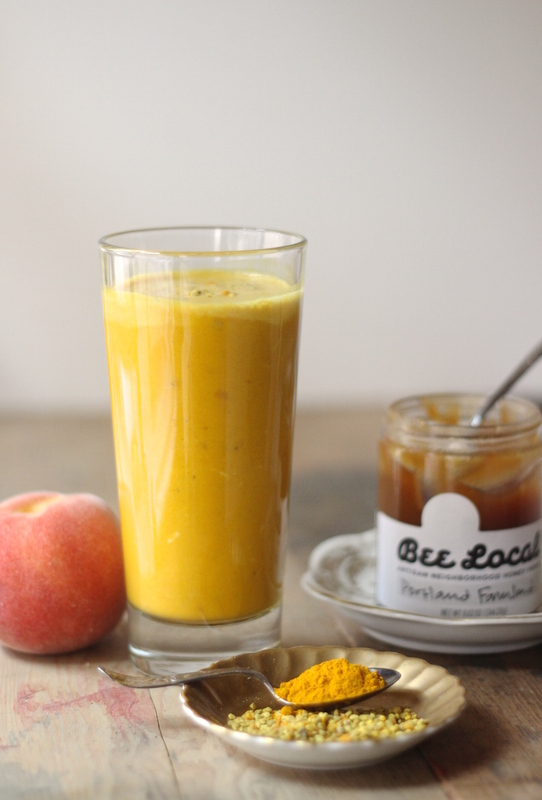 I took the rich orange and yellow hues of ginger, turmeric and bee pollen and enhanced them with fruits of the same color: pineapple and mango, with banana and coconut flesh added in for good measure. Cucumber water is one of my all-time favorite summer drinks. 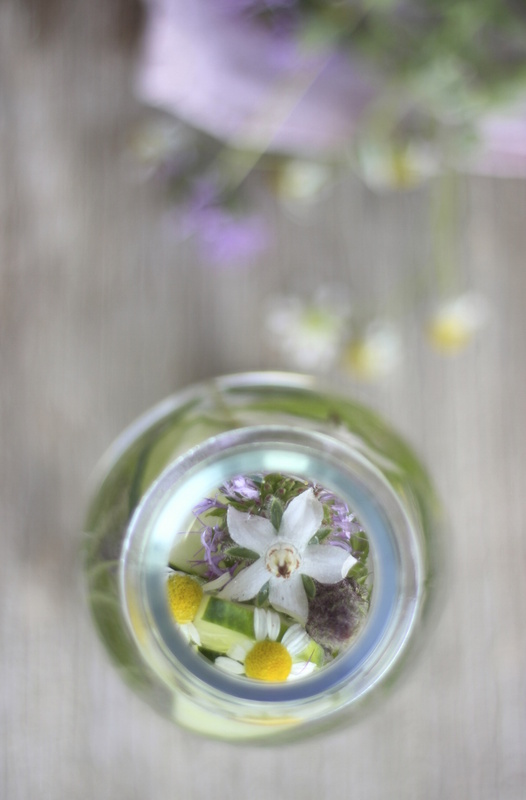 Usually, I add lime or pear slices, but I was inspired by the herb garden at Wildcraft Studio School to gather a bunch of tea herbs to my jar. 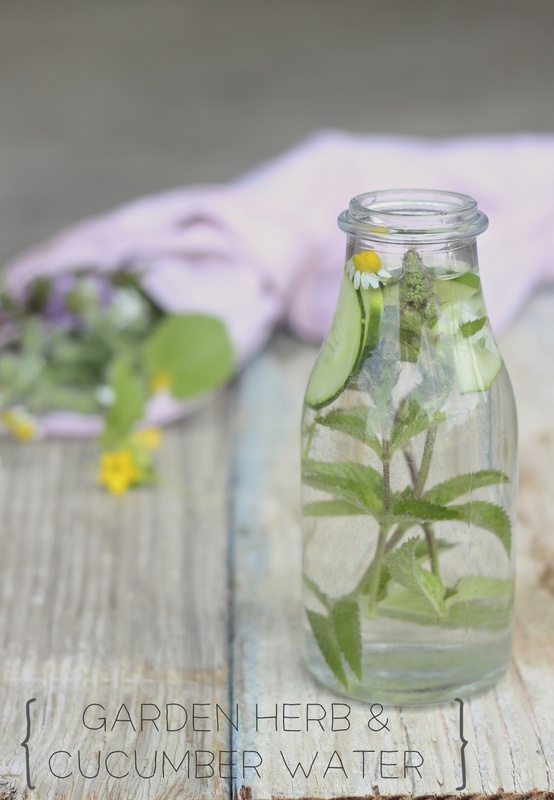 This fresh herb-infused water was lighter than a brewed tea, and the crisp garden cucumber slices were of course refreshing, but they also added an palatable new dimension of texture to a the water. Cucumbers are a little mucilaginous, don’t you think? That’s a technical way of saying slimy. Cucumber water is a tad cloudy, if you look closely. I’m waxing poetic about the every-so-slight slimy/mucilaginous texture of cucumber water because a) I think that is what makes it so refreshing to eat and drink, and b) said texture is what blends so nicely with the flavors of fresh garden herbs. In short, the weight of the cucumber carries the lighter yet more pungent flavors of the herbs. A match made in heaven (or the garden). Every year I am astonished at the fine crop of chickweed that grows in my container garden. Motherhood isn’t always easy. Sometimes you need a little boost, a bit of support. Of course the help of family and friends is important, as is a supportive community. But for the day-to-day challenges and triumphs, I call on the plants to help me out. 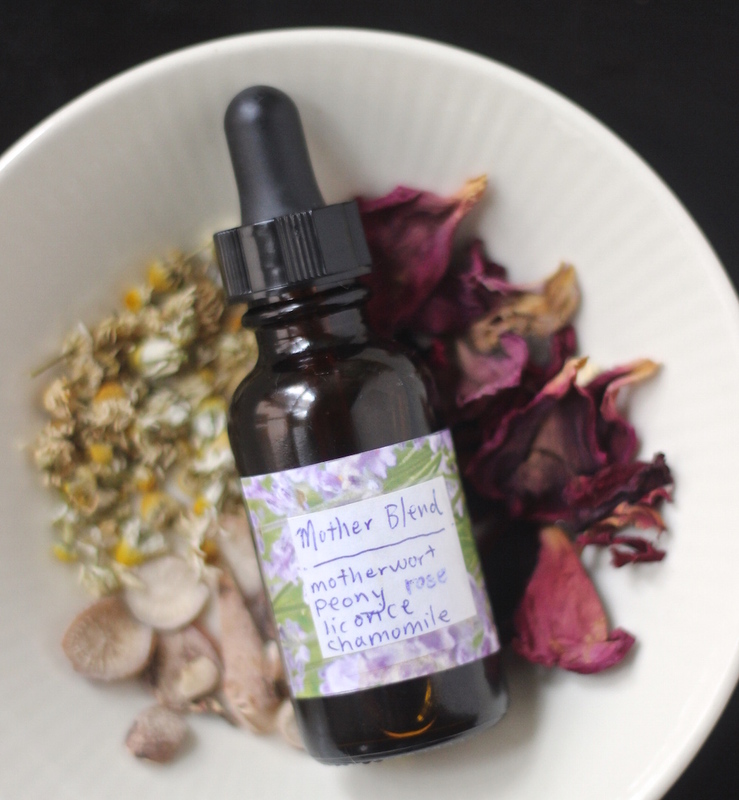 It’s easy even for a postpartum-brained lady like myself to formulate a mothering tincture…because the star herb has Mother in its name, Motherwort! I wrote about lovely motherwort in 2008 in this post, if you want to learn more about it’s medicinal side. Actually, there are two stars in this formula; the other being peony. I find that peony is an intensely womb-connected plant and quite motherly itself. If you look through my posts, you’ll see how much I adore Rose Elixir as a tasty, versatile preparation. I use it for blending tinctures to add an exotic flavor and sweetness, as a heart-centered remedy for anxiety, sleep, broken hearts and circulation, spiced and combined with aphrodisiac herbs, and as a burn remedy. Instead of straining my last batch of elixir after 8 weeks like I normally do, I kept it intact because I use the petals directly on burns as bandages. These rose petal bandages are so so so useful; I can’t image living without them. It turns out that I burn myself often. My herb nook has taken up all free space in out tiny kitchen and has long since relegated the toaster oven to the storage unit. I toast things directly on the oven racks and repeatedly stick my bare hands in and if I’m not careful, I get a burn on the top of my right arm of where I brushed the rack above. Yes, I have many a burn on that arm, same size, shape and location. Rose petal bandages have been used on most of them, and I can tell you that when I use them, the pain is significantly reduced and the healing heightened. I ran out of my last bottle of strained Rose Elixir for tincture blending and it became obvious that I needed to strain my batch after all. 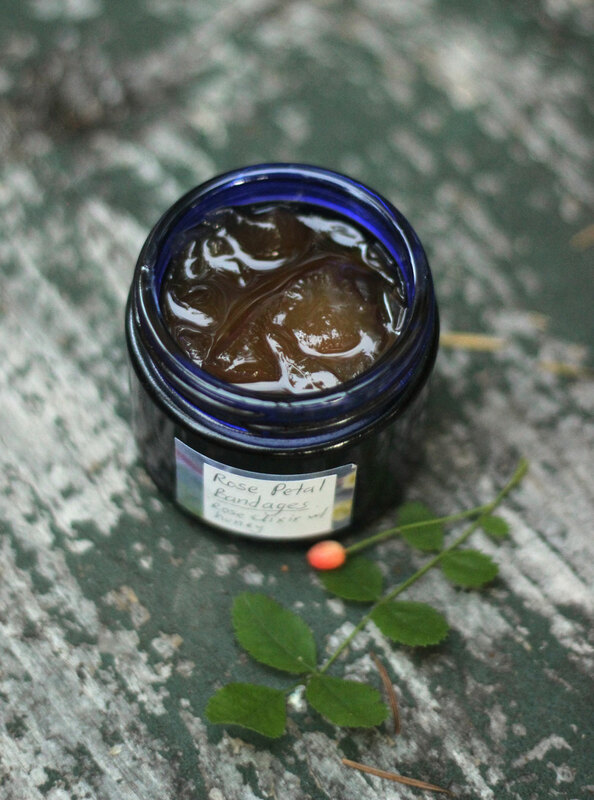 As a compromise, I saved a small jars’ worth of petals preserved in the elixir as my bandage cache, and I am so glad I did because, guess what, I burned myself not long after. To use the Rose petals as bandages, fish out a petal with a utensil, tear or cut to a shape suited for the burn and adhering to the contour of the affected area if not already perfect, and place on clean, dry skin right over the burn. Leave it on as long as you can; I’ve left it on for hours. 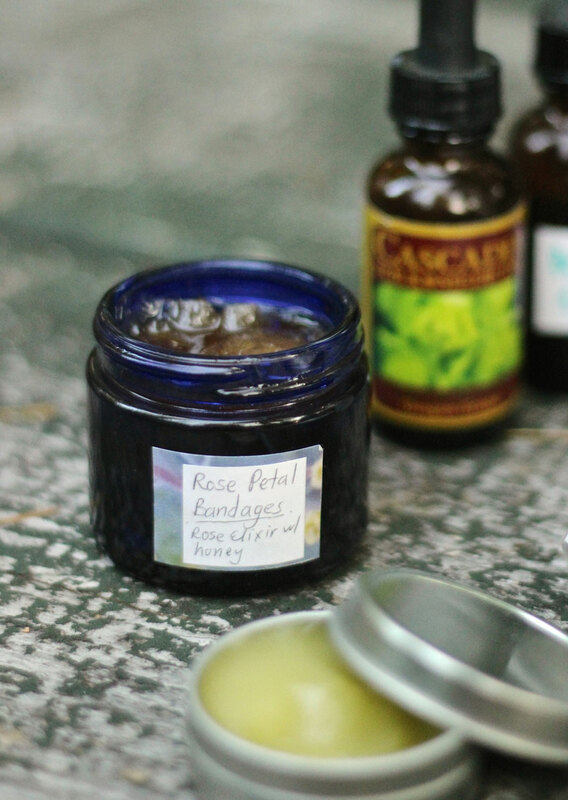 If Rose elixir runs, wipe it off with a wet towel or you’ll create an even more sticky mess. Yes, this is a sticky remedy. Rose elixir is half alcohol and half honey or glycerine, after all. 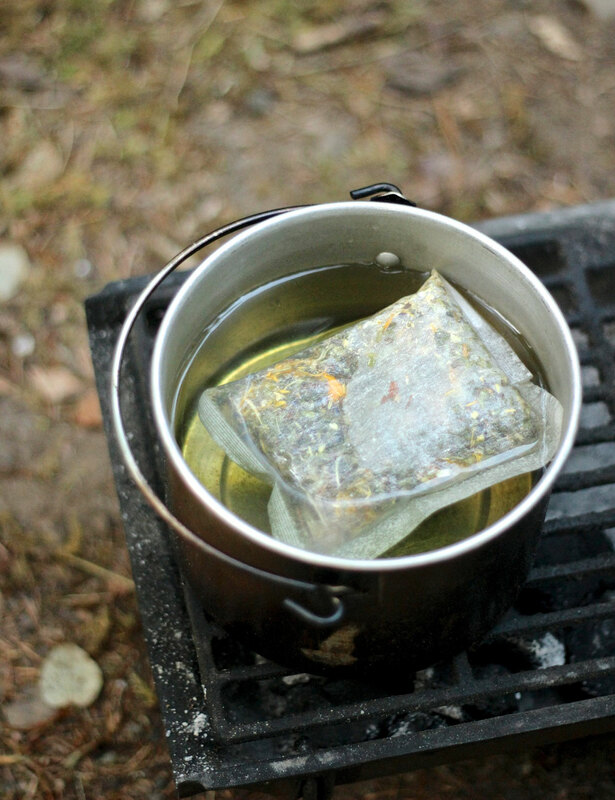 Glycerine is less sticky but also less effective for burns (although it makes a fine vegan-friendly elixir). After the bandage has been on for about 30 mins, it starts to dry and adhere to the skin quite nicely. Be careful not to bump the bandage or get it stuck on clothes and things. If I have had a Rose petal bandage on for many hours and it has dried perfectly, then I will go to bed with it. But if it is at all sticky, cover it with a piece of gauze and a regular bandage to keep it on and protect your bedding from being a sticky mess. For kids, or for large or awkward areas, I would always cover the Rose petal bandage with another bandage. I’ve had this batch of petals for over a year and they still do the trick. This is definitely going into the traveling first aid kit! 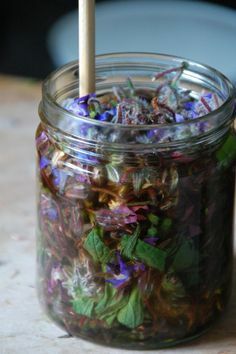 I’d like to get more small jars for keeping the petals and share with family and friends, because I have need seen anything work so wonderfully for burns. The application of one Rose petal take the burn out immediately and for as long as it’s on there I feel relief. I’ve seen the residual burn feeling completely disappear after 4-6 hours of using one petal, even one hour for minor burns, although I often keep it on longer because it helps heal the skin. Honey in and of itself is a great burn remedy because it locks out air from reacting with the burn, kind of smothering it. 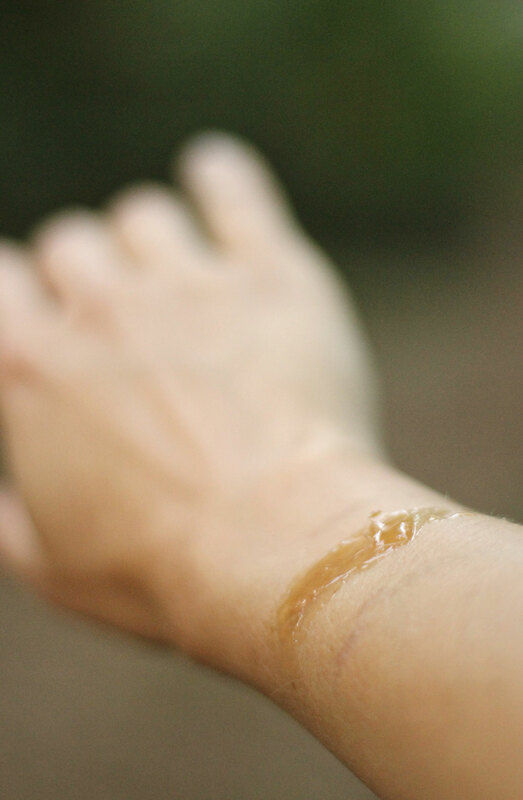 Plus, honey is antiseptic, skin and wound healing. 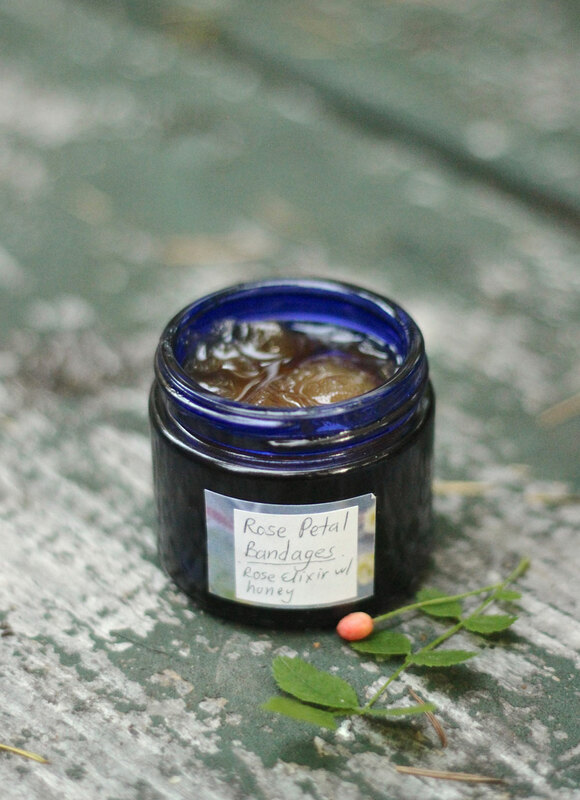 Rose is a cooling remedy and also anti-inflammatory and skin soothing. Normally I wouldn’t put alcohol on burns even, but this is a Rose-infused, honey-laden alcohol and adds to the aseptic qualities of the elixir. All around, a great combination. The Rose petal itself doesn’t irritate the burn area like normal plastic bandage. It creates an air-tight, medicated seal. The petal dries transparent or opaque-pink; you can hardly see it.